Twelve years after discovering her mother's suicide, 17-year-old CLARE SHANNON (Joey King) is bullied in high school, embarrassed by her manic, hoarder father JONATHAN (Ryan Phillippe) and ignored by her longtime crush. All that changes when her father comes home with an old music box whose inscription promises to grant its owner seven wishes. While Clare is initially skeptical of this magic box, she can't help but be seduced by its dark powers, and is thrilled as her life radically improves with each wish. Clare finally has the life she's always wanted and everything seems perfect - until the people closest to her begin dying in violent and elaborate ways after each wish. Clare realizes that she must get rid of the box, but finds herself unable and unwilling to part with her new-and-improved life - leading her down a dark and dangerous path. Download Wish Upon in Digital HD from the iTunes store. Wish Upon images are © Broad Green Pictures. All Rights Reserved. What would you do if you found a magic lamp that could grant you wishes? What would you wish for? What if the lamp was instead a Chinese music box with an ancient inscription you can't quite decipher but you soon realize you can make those wishes? What happens when you start to realize those wishes had dire consequences? That is the premise of Wish Upon, a 2017 release from Broad Green and Orion Pictures now making its way into stores on Blu-ray and DVD. From the Director of Annabelle, it shows us how this music box changes one teenager's life. Clare (Joey King; White House Down) is an average teen. She isn't all that popular, doesn't have much money, and is haunted by the memory of her mother's suicide. Her father (Ryan Phillipe; Shooter) is an embarrassment and a Dumpster Diver. Her crush doesn't even know she exists (of course). Then, one day, she gets a Chinese music box and casually mentions that she wishes her archenemy would "rot". The next day the bully ends up in the hospital with a rotting flesh disease but Clare doesn't make the correlation. A few wishes later and some translating, Clare has become richer, her mom is alive, her dad isn't embarrassing and she is popular at school. Oh, and that cute boy she was crushing on… yeah, he likes her now. However, Clare has come to realize that with each wish that is granted, there must be a blood sacrifice and someone close to her dies. With help, she also finds out that after the seventh wish the box takes the soul of the person wishing and Clare suddenly realizes (Spoiler Alert!) that is how her mother actually died. Trying not to suffer the same fate as her mom, Clare attempts to get rid of the box and right the wrongs her wishes created, to no avail. I must admit, I'm not a fan of Phillipe in general but I thought he did a decent job here. He wasn't over the top nor flat as I sometimes feel he can be and he seemed more suited to this role. King, however, is a young actress whom I enjoy watching and this was no exception. I thought she did well with the source material and showed layers to her character as she makes her wishes and goes from a nobody to popular; from poor to rich. The supporting cast help round out the picture but no one really stands out amongst the others. The two-disc set offers both the Theatrical release and the Director's unrated cut. It is presented in the standard 1080p high definition video with a 2.39:1 aspect ratio. The picture quality is very good, which is a plus for this film, and the effects don't look especially fake or cheesy. The DTS-HD master audio 5.1 enhances the overall scare factor and is generally crisp and clean. 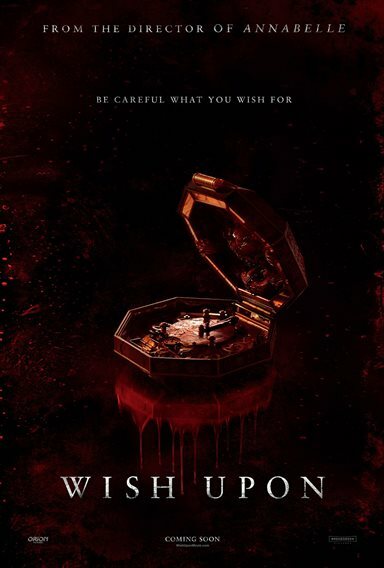 There are 4 extras including I wish: The cast share what they would wish for, Attic Tour with Joey King, Directing Darkness: John Leonetti and Cast talk about developing a horror film and Motion Comics: Lu Mei's Curse and Arthur Sands reveal the stories behind the previous owners of the box. As horror movies go (a genre I generally am not a fan of), Wish Upon isn't especially gory and doesn't offer all that many "scares". There were a few times I jumped but not all that often. And, of course, the concept of finding a mystical box that grants wishes but that comes with consequences isn't original. It is, once again, a cautionary tale of "be careful what you wish for". Wish Upon images © Broad Green Pictures. All Rights Reserved.